The largest proportion of our respondents — 44 per cent — took a gloomy view towards CCS, saying that the technology would increase the price of electricity to unacceptabe levels. The next largest group, a little under a third, took a different view, opting for a search for an altogether different technological approach to the technique. 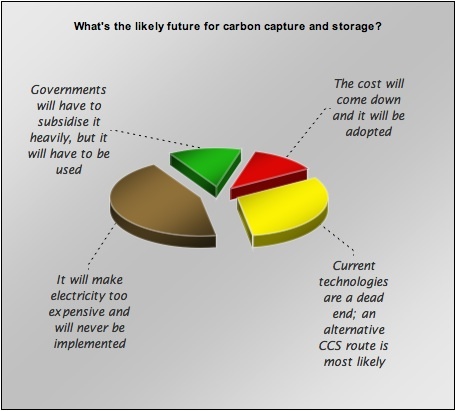 Optimists were in the distinct minority last week — only 12 per cent went for each of the positive options, with heavy government subsidy keeping CCS viable or the normal technological market approach, which sees costs coming down as the technology matures. What do you think of these results? Did we get the options right, or are there other answers? Is CCS the only way that fossil fuel burning can be practical in future? Leave us your opinions below. By the time carbon capture and storage technology is developed there will be little need for it. The combustion of fossil fuels is just a blip in the energy supply system. For a relatively short period it superseded renewable energy derived from windmills, wood burning, sails and horse power! Energy is now starting to be obtained by the electro-chemical conversion of renewable energy sources. As with any new technology, the cost of fuel cells is coming down as technical maturity and economies of scale are reached. Instead of digging up more carbon and storing it for hundreds of thousands of years, why not recycle that which we already have? Engineers have developed successful prototypes which extract carbon dioxide from the atmosphere and synthesise it with hydrogen to form gaseous or liquid fuels. With fuel cells, the overall efficiency could be greater than at present without adding to atmospheric carbon dioxide. Alkaline Fuel Cells reach 60 to 70 % efficiency with increased hydrogen obtained by water shift reactors, while Solid Oxide fuel cells can top 80% at high temperatures. Britain should be doing more to support the engineers developing innovative technologies for the new clean energy markets opening up globally.